J&L Wire Cloth LLC is a manufacturer of galvanized wire decking and woven wire flooring. For over 25 years, we have provided the material handling industry with top quality wire products. 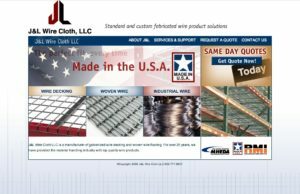 J&L Wire Cloth LLC manufactures and fabricates galvanized and brite basic wire for wire decking, shelving and racks used in warehouse storage, material handling, and logistics. Located in St. Paul, Minnesota, J&L Wire Cloth also manufactures woven wire flooring and confinement panels for the agricultural industry for hog production. J&L Wire Cloth was founded in 1980 as a manufacturer of welded and woven wire forms. They remain a market leader in galvanized woven wire flooring for livestock, and a key supplier to many domestic users of galvanized wire decking.